We’ve played and reviewed a number of rabbit-related online slots in the past; not too many but enough to make us think that these fluffy creatures hold a special place in the world of virtual gaming. This one’s called Jumpin’ Rabbit and it’s been developed by 2by2 Gaming. If you’re looking for something cheerful, cure and entertaining, this may well be the slot for you. 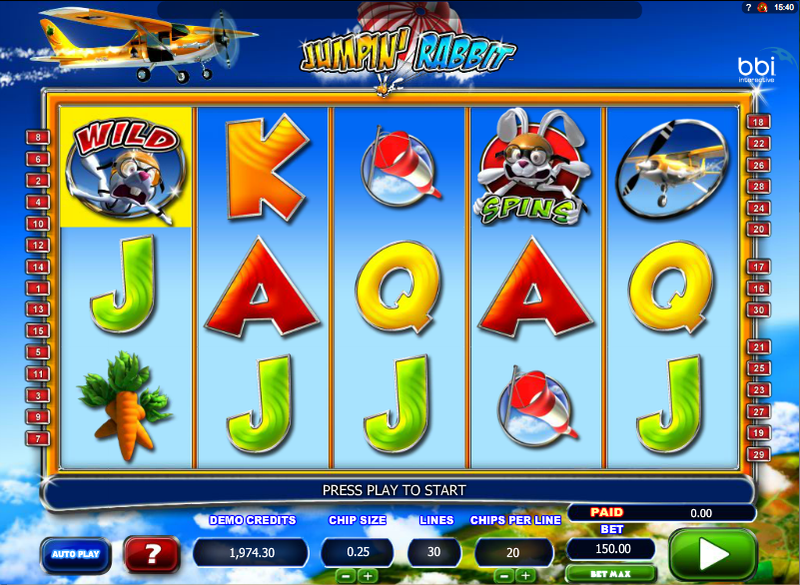 Jumpin’ Rabbit features five reels and up to thirty paylines; the rabbits in this case are free fall parachutists and the backdrop to the reels tells us that we are high in the sky, looking down through clouds onto green fields below. The main symbols in the base game are a windsock, a bunch of carrots, some flying goggles, a small aeroplane and a Jumpin’ Rabbit logo. That logo is the most valuable symbol, worth 500x your line stake for five on an active payline. J, Q, K and A are the low value symbols. The wild symbol is the yellow-hatted rabbit plunging through the air and the main feature is activated by his colleague, falling in a similar manner but wearing an orange hat. Wilds can be stacked which means it’s possible to fill all positions on one reel with wilds. 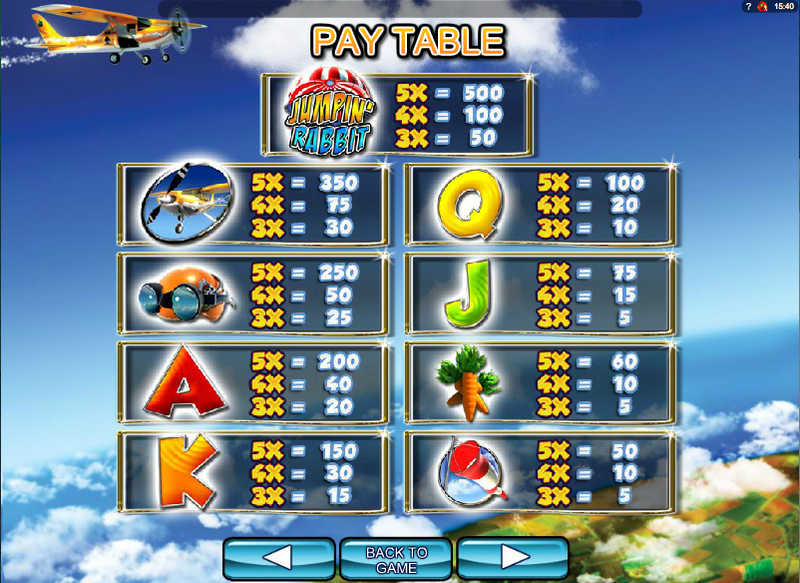 There’s just one feature here and it’s some good old free spins; they are triggered by landing the free spin scatter symbol on reels two, three and four. You will now receive ten spins and during this feature a different set of reels is used which includes more wild rabbit symbols. The spins cannot be re-triggered from within this phase, which is of course a shame. This is a cheerful enough animal-themed diversion with a fairly unobtrusive soundtrack. Perhaps it could do with a little more imagination as far extra features go but it’s good fun nonetheless.